Duchesse de Polignac: [to Léonard] I love your hair. What's going on there? I have seen this film yesterday after a lot of hype up and waiting since in my little town everything comes out a month after the release date. I was looking forward to seeing this movie..a lot. But I must say that the trailers I had seen and the film have a completely different feeling. This isn't a bad film but I think that it well get a lot of criticism for not being historically accurate, not serious enough, being too long, being 'unfinished'... but those are not he bad points of this movie. The style is original and Sofia Coppola succeeds at showing Marie Antoinette's personal side. Her suffering through gossip and humiliation by her husbands lack of 'interest' in her etc. She succeeds in showing Marie Antoinette as a naive girl in the beginning..who hugs her first lady, cries at parting with her dog and announcing that the morning ceremonials are ridiculous. We see Marie Antoinette at the beginning trying to fit in with the strict life at Versailles but further on it's clear that with the gossip following her she stops caring and starts to have fun her own way which leads to her ruin. The negative points of the film is that Sofia Coppola uses the same techniques, the same scenes through out the movie. The trying on of shoes, the hairdressing, the patisserie dishes and the champagne. We see Marie Antoinette frolicking around in the grass too many times. Sofia Coppola apparently tried to show a girl out of touch with reality who lives just to have fun..to escape the wagging tongues of Versailles. But if that was her point the film should've ended long before. 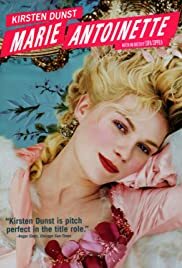 This is a biography of Marie Antoinette...even though not a completely serious or historically accurate one...but if Sofia Coppola is trying to show this French queens personality and human side then I can assure you there was more to her than the frilly lace, the satin shoe, the bakery department and the champagne. Marie-Antoinette was a mother who cared about her children and was involved with them..though we hardly we see this in the film except the sequence of her and her daughter on the farm. The relationship and the feelings she had for her husband aren't very clear and his for her aren't very much elucidated. This is a visually beautiful film but I think Sofia Coppola could've delved deeper into this rich personality. In the end you're left with the impression of stepping out from a hazy rose petal fragile dream that from someones tumultuous life. But a dream that's still worth seeing. 197 of 308 people found this review helpful. Was this review helpful to you?